» ARCSS/TK stream dissolved organic carbon biodegradability (2011). In 2011, we collected samples from streams and rivers four to five times near the Toolik Field Station and in the Anaktuvuk River burn area (June to August 2011) and once near Feniak Lake (July 2011). In the Toolik area we sampled two rivers (KUP and OKS) that have not been impacted by fire or thermokarst and have been well-studied by the arctic long-term ecological research community. In the Anaktuvuk River area we sampled 6 individual rivers/streams: two rivers (North and South Rivers) that were burned and unimpacted by thermokarst (5 times); 2 streams that drained adjacent burned watersheds (names Valley of Thermokarst, VTK), one of which was impacted by numerous active layer detachment slides on the south-facing slope (we sampled lower in the paired watersheds 5 times and sampled in the upper watersheds 4 times); and 2 rivers located just north of the burn boundary (1 time) to serve as a reference for the sites located within the burn. In the Feniak area, we focused our efforts at two sites for DOC collection. We sampled 2 separate tributaries in one small watershed (Blood Slide Creek), one tributary draining southeastern side of the watershed impacted by a very fresh, active layer detachment slide and the other draining the northwestern portion of the watershed unimpacted by thermo-erosion. The other location in Feniak was along a larger river impacted by 3 large, active retrogressive thaw slumps. We sampled upstream and downstream of both the first and third thaw slumps. To quantify seasonal variability of BDOC, repeat measurements (4-5 times over the 2011 summer season) were taken from the Toolik and Anaktuvuk Burn stream sites. Sites located in the Feniak Lake area were sampled only once due to a limited time spent in the region. At each site, we collected four replicate field samples, which we filtered (0.7 uM, Advantec GF-75) into 250 ml amber LDPE bottles for transport to TFS and set up incubations within 24 hours of collection. We also collected separate bottles for background water chemistry (filtered and preserved appropriately for later analyses) and for photometric absorbance analyses (filtered and measured within 24 hours). Biodegradable DOC (BDOC) is defined as the percent DOC loss (due to mineralization, uptake or sorption) over time, typically 7 – 40 days [McDowell et al., 2006]. We characterized BDOC loss after 10 and 40 days. The complete details of the BDOC assays can be found in Abbott et al (2014). In brief, after collection and filtration in the field (see above), 31 ml aliquots from each field bottle (4 field replicates) were filtered through 0.22 um sterile, polyethersulfone membrane filters (Sterivex GP 0.22, Millipore) to remove bacteria, and transferred to 70 ml amber glass incubation vials. The 0.22 um filters were used to remove bacteria from all sites collected on a given day to control for variability in microbial community among sites. The filters were removed from the capsule with a sterile razor blade and placed and shaken vigorously in 100 ml of de-ionized water (to liberate bacteria from filters) and allowed to soak for 30 minutes. Prior to initial day 0 sampling, 1 ml of the bacterial inoculum was added to each incubation vial and gently swirled. All incubation vials received a nutrient amendment by an increase of 80 uM NH4+ / NO3- and 10 uM PO43- following [R M Holmes et al., 2008], to relieve potential nutrient limitation of DOC processing. Incubation vials were stored in the dark at room temperature and tightly capped to prevent evaporation, but opened and swirled weekly to ensure adequate access to oxygen for sustained microbial activity. To quantify DOC loss, we subsampled each incubation vial three times at day 0, day 10 and day 40 (t0, t10, and t40, respectively). At each time stamp, 5 ml was removed in a sterile manner from each vial, filtered (0.22 uM) into acid-washed glass scintillation vials, and acidified with 100 ul of 2N HCl. Therefore, the change in DOC concentration over time represents DOC loss due to both mineralization and uptake since the filtration removes microbial biomass before DOC measurement. Acidified samples were stored in the dark at room temperature until DOC analysis. We measured DOC with a Shimadzu TOC-5000 connected to an Antek 7050 chemiluminescent detector to also quantify total dissolved nitrogen (TDN). We chose to focus on DOC loss over 40 days (t40) to be the most ecologically relevant to address our questions, and refer only to 40-day DOC loss in this paper. DOC loss (absolute and %) was calculated for each separate field replicate sample (n=4) per sampling date. Absolute loss at 40d was calculated as DOC concentration at day 0 minus DOC concentration at day 40: [DOC]t0 – [DOC]t40. DOC loss (%) was calculated as DOC concentration at t0 minus DOC concentration at t40 divided by initial t0 concentration ([DOC]t0 – [DOC]t40)/ [DOC]t0. Calculations were made considering the t10 time stamp (i.e. ([DOC]t0 – [DOC]t10) and ([DOC]t10 – [DOC]t40)) for reasons explained in Abbott et al 2014. Mean values for initial DOC concentration (uM); absolute 40-day loss (uM); and 40-day loss (%) were calculated from the 4 field replicates for each site and date. Quality control of the calculations was evaluated on a case by case basis and any sample where an erroneous DOC measurement was suspected was removed. In the calculation using [DOC]t0 and [DOC]t40, only 1 replicate out of the total 184 samples was removed. We characterized DOC composition by Specific Ultraviolet Absorbance at 254 nm (SUVA254; L mg C-1 m-1 ), a photometric measure of DOC aromaticity [Weishaar et al., 2003]. UV absorbance was measured within 24 hours on a Shimadzu UV-1601 using a 1.0 cm quartz cell and was calculated by dividing UV absorbance divided by [DOC]t0. Water samples for background water chemistry were also sampled at the time of BDOC field collection. At some sites, water samples were collected for chemistry more often than BDOC collection days, therefore, we included all available data when characterizing background water chemistry variables. 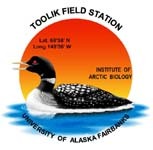 Feniak sites were sampled one-time by grab sampling. All other stream sites in the Anaktuvuk and Toolik area had ISCO automated samplers deployed for daily composite sampling, except for VTK REF UP and VTK IMP UP which were sampled four times by grab sampling. The following variables were measured as background chemistry at each site: Total Suspended Sediment (TSS, mg L-1); Alkalinity (ueq L-1); Total Dissolved Nitrogen (TDN, uM); Ammonium (NH4+, uM); Nitrate (NO3-, uM); Total Dissolved Phosphorus (TDP, uM); soluble reactive phosphorus as phosphate (PO43-, uM); and base cations (Magnesium, Mg+; Calcium, Ca+; Potassium, K+; Sodium, Na+). See the LTER Streams Protocols for the details of water chemistry collection and analyses .